On today's blog, we have an interview with Amy Stone, who is running the Ironman Triathlon for CCA this July. 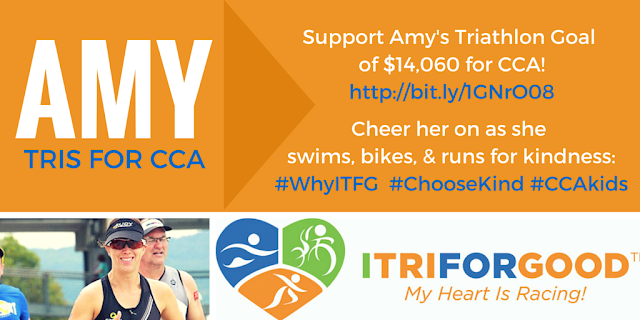 Three Cheers for Amy! You are an inspiration and we appreciate your efforts to help the world #ChooseKind. CCA: Please tell us who you are in a nutshell. AS: My name is Amy Stone and I live in Miami, Florida. I am a mom, wife, photographer, runner and triathlete. I retired from the corporate world when my son was 2 years old and training and writing about running and triathlon fill my time now. CCA: When did you start running? AS: I started endurance running in my 20s. I was in a new town (Miami) and joined a fitness club at a local running store (Footworks). When the owner saw I was young and fit she graduated me to the half-marathon training group and then I went to the marathon group and the rest is history. CCA: What's your favorite part about racing and fitness? AS: I’ve made my best adult friends through running and triathlon. It’s my community. Keeps me healthy and sane. CCA: How do you define "healthy?" AS: Healthy is a tricky word because sometimes health is out of our control. But I like to make good lifestyle decisions where possible. I have 4 daily goals: eat real food, drink plenty of water, exercise every day and get a good night of sleep. I’m not always perfect but good enough so far seems to be okay. CCA: What do you tell yourself when you want to quit? AS: I try to figure out why I want to stop. If it’s in a race I usually have a go to thought or mantra to pull me through. I think of those who have greater challenges than myself and that usually pulls me through. CCA: Why did you choose CCA and specifically, CCA Mom Erin Dinsmore, as the cause for your race? AS: During my last training cycle I was helping a training friend raise money for Chrons and Colitis (a cause near to her) and during that time Erin was going through a fight with insurance over something to do with Eli’s care. She has always been open with information about Eli. I thought at the time I wish I could do something. So when it came time to train for Ironman Lake Placid, I reached out and said "I want to do something for you." CCA: So, you and Erin were sorority sisters together. How did that experience foster this lasting friendship? AS: Erin and I are getting to be OLD ladies and our friendship pre-dates Facebook. Ha! But we did live together in the sorority house for at least one year which binds us pretty well. Neither of us is what you’d call a "traditional sorority girl." Truth is there aren’t very many of those traditional sorority girls if you care enough to look closely. When we were out of school and older we reconnected via Facebook through our sorority sisters. Somebody had the nerve to post an old Bid Day photo which was a lot of fun. Our Kappa Kappa Gamma network is one that follows us as we age. I continue to be amazed at how the friends I chose in high school and college continue to be such wonderful people. AS: This week my inspirational saying is: Be miserable. Or motivate yourself. Whatever has to be done. It is always your choice. CCA: What's your advice to others who want to make the world a kinder place? AS: It’s one of the hardest lessons of growing up and everybody learns it a different way and at a different time but the truth is life is just hard. Even if we don’t know what challenges a person faces that doesn’t mean they don’t have any. I tell my kids just because you don’t know a person’s story doesn’t mean there isn’t one. Just be kind.